On my quest to visit some new islands in Thailand I ended up at Ko Phayam; an island in the Andaman Sea in Ranong province, close to Myanmar. The most distinguishing feature of the island is that it is car-free. Apart from some tractors the only motorised transport is motorbikes. The island has a network of concrete roads that support bike traffic but it is otherwise underdeveloped. Power is not 24 hours at some places, there are no ATM’s, and the internet is patchy. That sounds like a nightmare for this digital nomad, yet I enjoyed my stay here. If you come here looking for the creature comforts that the more popular islands offer (like Koh Samui) then you will be disappointed. I went knowing that I would not get any work done and that I would be roughing it a little, and I had a relaxing time. I stayed near Ao Yai (Long Beach) which is the most popular beach on the island. The water isn’t cyrstal-clear but it wasn’t as bad as I have read about. The sand is nice to walk on and for the most popular beach it isn’t that busy. I also enjoyed the beach during low tide when the water recedes to reveal thousands of crabs holes and their perfectly-formed balls of sand they create. Ao Yai faces west so it is the ideal sunset beach. I still haven’t been to the hippy haven of Pai in Northern Thailand, but I have heard Ko Phayam being described as “like Pai, with a beach”. With no cars on the island there hasn’t been rampant development as seen other Thai islands, which has made it an ideal hippy enclave. If I had known this before I went I might not have gone, or at least would have gone thinking I wouldn’t like it, so I was surprised that I liked it so much. It is nothing like Ubud in Bali, which has become so self aware of its hippiness that it has become a parody of itself. I met a few people who spend months at a time here, and have been repeat visitors. Near the bungalow I was staying at was this cafe called Baan Namcha. I loved the little library they have inside. With intermittent electricity and terrible internet, the island is an ideal place to kick back and read books. If there is one sound that I associate with Ko Phayam, it is the sound of cashew fruits plopping on the ground. I had never stopped to think what a cashew tree might look like, and I never would have guessed that the nut is actually a seed that grows on the bottom of a false fruit. The island is covered in cashew trees and you could see splattered fruits on the concrete roads, and smell the rotting fruits everywhere. I stayed in a bungalow that was set in a cashew plantation which only added to my association. Most islands I have read about in Thailand usually includes the advice to “get there before it is overdeveloped!” While there has been development on the island I can’t see it being overdeveloped without first developing the road infrastructure to support cars. For now the island has an abundance of hippy bungalows with some mid-range bungalows and resorts. I stayed at the Phayam Sport Bungalow. This is a rustic bamboo bungalow which was about 500 metres from the beach. kohphayam.org – A site dedicated to the island with maps and info on how to get there. 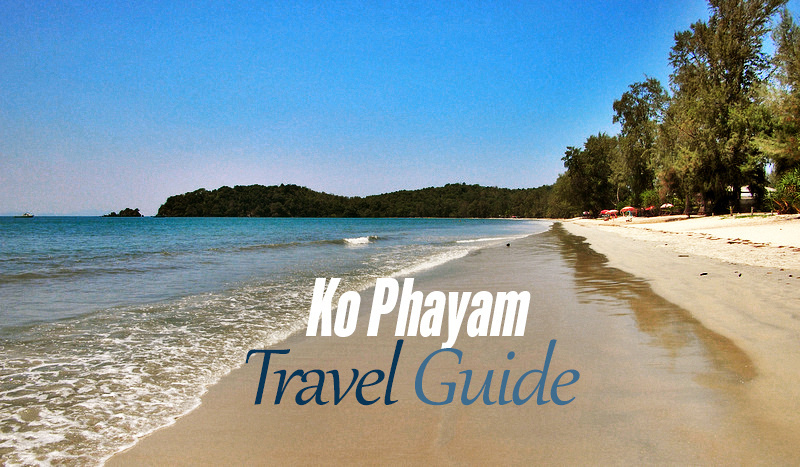 Ko Phayam – The Travelfish guide to Ko Phayam has a good overview of the island. Koh Phayam: ‘Like Thailand’s Koh Samui in the 70s’ – The headline of this article might sound like link bait, but it is close to the truth when you consider that the island has no cars, no mains electricity, and no McDonalds or Starbucks. On islands, snobbery, and Koh Phayam – I was fortunate to visit Ko Phayam without any expectations. Somehow I had not crossed paths with any backpackers that recommended I go. If I had I may have had the same experience as Kate. A love letter about my favorite paradise island, Koh Phayam in Thailand – imperialfool.com. Travel back in time on Koh Phayam – renyagolnitzer.com. Koh Phayam – Thailand’s best kept secret island – onestep4ward.com. Ko Phayam Photo Gallery – Photo gallery of Ko Phayam.